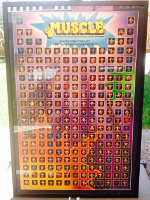 This week Professor Terry takes a look at the Color M.U.S.C.L.E. Poster and shares some discoveries and a few of his own theories. A great MUSCLEMANIA lot, some interesting larger lots, and some Class A auctions which should be fun to watch. This is the official archive for The University of M.U.S.C.L.E. as it attempts to document a full 233 counterfeit M.U.S.C.L.E. figure collection through the submission of collectors’ pictures. The collection is part of Art 100. The 28-pack write-up has been long delayed because of the desire to add individual pictures of each 28-pack figure. Additionally, there are a few 28-pack pictures that also need to be taken. Instead of withholding the entire topic it seemed better to make the current information available; adding pictures and various improvements over time.